Is Brahman sentient in Advaita Vedanta? If Brahman is Consciousness and Omniscient, then he should be sentient also since both are indiscernible. Omniscient is a property of Ishwara i.e. Saguna Brahman not Nirguna Brahman. As per Gita Krishna alone is omniscient. O Arjuna, as the Supreme Personality of Godhead, I know everything that has happened in the past, all that is happening in the present, and all things that are yet to come. I also know all living entities; but Me no one knows. The fourth aspect of Atman or Self is Turiya, literally the fourth. In this fourth state, consciousness is neither turned outward nor inward. Nor is it both outward and inward; it is beyond both cognition and the absence of cognition. This fourth state of Turiya cannot be experienced through the senses or known by comparison, deductive reasoning or inference; it is indescribable, incomprehensible, and unthinkable with the mind. It is serene, auspicious, and non-dual. The Nirguna Brahman is just the pure jivatma without any covering of mind and matter. So Advaita teaches the jivatma itself as the highest goal i.e. jivo brahmaiva na parah. It is also similar to purusha element in sankhya. The Atma, whose symbol is Om is the same as the omnipresent Brahman. Smaller than the smallest and larger than the largest, the Soul is formless and all-pervading. The goal of the wise is to know this Atma. The Atma is like a rider; the horses are the senses, which he guides through the maze of desires. After death, it is the Atma that remains; the Atman is immortal. Mere reading of the scriptures or intellectual learning cannot realize Atma. One must discriminate the Atma from the body, which is the seat of desire. Inability to realize Brahman results in one being enmeshed in the cycle of rebirths. Thus having learned the wisdom of the Brahman from Yama, Nachiketa was freed from the cycle of births. Disciple: Sir, is there any such statement in the Upanishads that Ishvara is an all - powerful Person? But people generally believe in such an Ishvara. Swamiji: The highest principle, the Lord of all, cannot be a Person. The Jiva is an individual and the sum total of all Jivas is the Ishvara. In the Jiva, Avidya, or nescience, is predominant, but Ishvara controls Maya composed of Avidya and Vidya and independently projects this world of moving and immovable things out of Himself. But Brahman transcends both the individual and collective aspects, the Jiva and Ishvara. In Brahman there is no part. It is for the sake of easy comprehension that parts have been imagined in It. 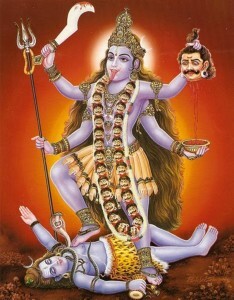 That part of Brahman in which there is the superimposition of creation, maintenance and dissolution of the universe has been spoken of as Ishvara(Saguna God) in the scriptures, while the other unchangeable portion, with reference to which there is no thought of duality, is indicated as Brahman(Nirguna). But do not on that account think that Brahman is a distinct and separate substance from the Jivas and the universe. The Qualified Monists hold that it is Brahman that has transformed Itself into Jivas and the universe. The Advaitins on the contrary maintain that Jivas and the universe have been merely superimposed on Brahman. But in reality there has been no modification in Brahman. The Advaitin says that the universe consists only of name and form. It endures only so long as there are name and form. When through meditation and other practices name and form are dissolved, then only the transcendent Brahman remains. Then the separate reality of Jivas and the universe is felt no longer. Then it is realised that one is the Eternal Pure Essence of Intelligence, or Brahman. The real nature of the Jiva is Brahman. When the veil of name and form vanishes through meditation etc., then that idea is simply realised. This is the substance of pure Advaita. The Vedas, the Vedanta and all other scriptures only explain this idea in different ways. What is the source of Sat Chit Ananda mantra? Of course Brahman is sentient. After all Brahman is consciousness itself. The Atman, equated to Brahman according to Advaita Vedanta, is always a witness to our actions. This would hardly be possible if Brahman is not sentient. No act done with the aid of the five organs of sensual perception, is ever lost. The five sensual organs and the immortal soul which is the sixth, remain its witnesses. However, Brahman's sentience is not like ours. Our sentience depends on Brahman while Brahman is sentient independent of the senses. Vedanta emphasizes the unknowability and indescribability of Ultimate Reality. Though unknown and unknowable, Brahman is the eternal "Knower of knowing" and also the goal of all knowledge. It is the Consciousness that functions through the senses but cannot be known by them. Saguna Brahman-literally means absolute with qualities. It is what people would call Krishna, Ram, Shiva. If the world is considered real for practical purposes, then god is regarded as the creator, preserver, and destroyer. Logically this god also has qualities of omniscience and is an all-pervading, omnipotent being. Clearly, according to this view, Brahman(or god) is a sentient being who is all loving, all powerful, all-pervading and can and therefore should interfere in the world affairs. Nirguna Brahman- literally means absolute without qualities is the Brahman that is devoid of any characteristics or qualities. This is the real or higher Brahman which cannot be described by any characters mental and non-mental. Hence is called infinite, real, consciousness(although this too is not the final description) According to Sankara's Advaita Vedanta, the world as we see is only an illusion, a mere show. And so those who believe the world to be real, accept this creator(saguna brahman) description of god.The goal of advaita Vedanta to realize this non-dual nirguna Brahman. Not the answer you're looking for? Browse other questions tagged philosophy vedanta brahman advaita consciousness . How does Vedanta (Uttara Mimamsa) school prove their Astikya (Existence of God) using Shabda pramana? What does the Vivarana school of Advaita believe about the nature of Avidya? What exactly is meant in Sankara(Advaita) Vedanta when it says that Brahman is Nirguna(attributeless)? How can Advaita Vedanta's Nirguna Brahman even exist? According to Advaita philosophy, is the Absolute Brahman formless? What do we mean by pure consciousness when we address Brahman? How does Nirguna Brahman manifests into Saguna Brahman? Why does nirguna brahman manifest only in 5 forms?